The WaterRower M1 HiRise rowing machine simulates the natural self-regulating rowing experience you feel on water. It offers not only the aesthetic pleasure and sounds of rowing, but lets you set the pace of your cardio workout. The Series 4 Performance Monitor displays 6 information windows for feedback including: Intensity in m/s (meters per second) or mph, 500m split, 2km split, watts, calories per hour, stroke rate, total strokes, heart rate (chest strap not included), time, and distance in units of meters, kilometers, and miles. Frame Length/Height: 88" x 27"
See this popular rowing machine on sale now at Amazon! 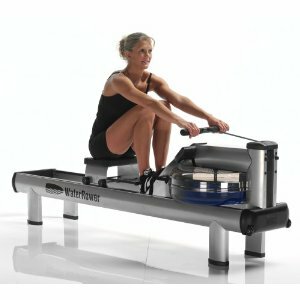 Critics just love the feel and performance of the WaterRower machines, and the M1 is one of the most popular models. The WaterRower M1 HiRise rowing machine has an easy-to-mount seat height of 20" (about the height of an office chair) as compared to the LoRise model which has a seat height of 12". It offers infinitely variable resistance using a water flywheel technology. The water tank uses drag paddles or impellers to provide resistance against the water. There are no knobs to adjust tension; you control the amount of resistance by your stroke rate. You can feel the resistance increase as you row faster, or decrease as you row slowly. You can also adjust the amount of water in the tank from 9 to 17 liters to alter the resistance. A precision spring clutch is engaged instantly when the handle is pulled so you don’t experience any dead spots or jarring at the start of each stroke. The smooth pull and constant fluid resistance of the blades against the water ideally simulate the natural dynamics of rowing a boat. It is a pleasurable sensation to work out on a WaterRower as well as hear the gentle lap of water sloshing around inside the tank. Other features on the WaterRower M1 HiRise include an ergonomically contoured seat, a maintenance-free and nearly silent drive strap made of high-density polyester webbing, floating heel footplates with straps, a fabricated tubular steel frame, and a 3-year parts/5-year frame warranty. These steel frame rowers come in your choice of silver, black, and white or you can choose a custom color if you order direct from the company. 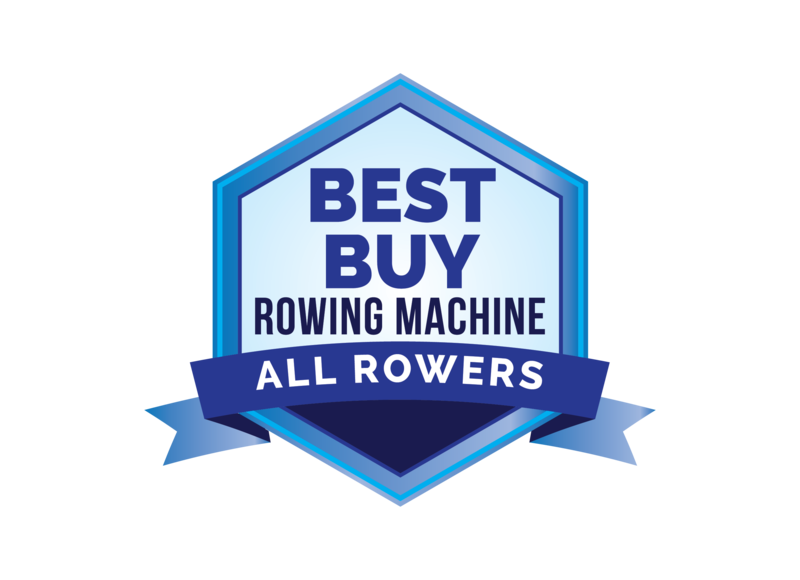 From the reviews by users on the WaterRower M1 HiRise rowing machine with the S4 Monitor, it is clear that you get your money’s worth with this high quality $1900 rower. If the seat height comfort is not an issue, we suggest you go with the M1 LoRise model and save $100. With either model, you get a phenomenal cardio workout on a wonderful machine that is durable, well-constructed, acoustically pleasing, and even great to look at when not in use. There is also a special limited edition Gronk M1 High Rise for all of you Rob Gronkowski fans. It is essentially the same rower except it is all black.